Alberta Koch Automotive Group, which owns a trio of Ford dealerships in the province, has launched what it calls e-commerce dealerships through its Koch Ford Lincoln Edmonton. An Alberta auto dealership group is preparing for future disruptions to the industry by giving its customers the option of buying new vehicles online and paying in full by using either a credit card or through PayPal. 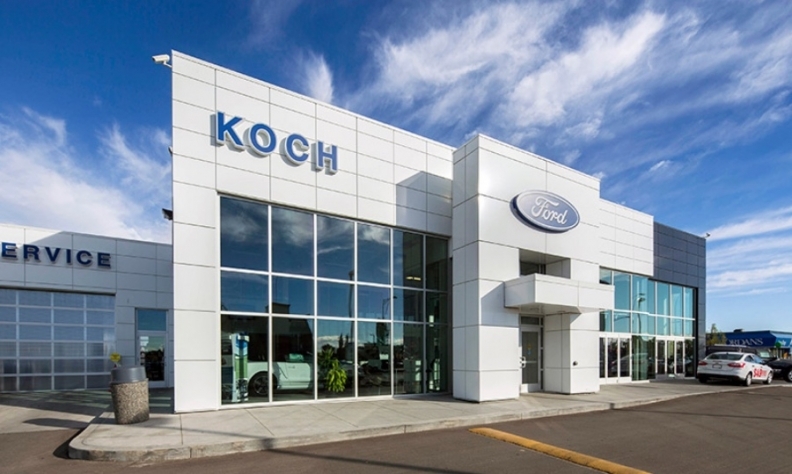 Alberta Koch Automotive Group, which owns a trio of Ford dealerships in the province, has launched what it calls e-commerce dealerships through its Koch Ford Lincoln Edmonton store and DK Ford location in Leduc, south of Edmonton. By logging on to the dealership’s websites, the buyer can reserve or purchase a vehicle without ever physically stepping foot into the dealership. Koch first tested the idea by selling used vehicles online through the Koch Auto Depot. The group offered very inexpensive vehicles for sale online and the purchase could be completed in full through a website to see how customers reacted and how the system would work. With the test runs complete, consumers can now browse inventory, chat with live operators, and reserve or purchase a vehicle, all from the convenience of their computer. Using the online “reserve” option on the website, consumers reserve a vehicle with a refundable one-per-cent deposit, which prevents other customers from purchasing the vehicle that the online shopper is interested in. Online deposits are risk-free and money-back guaranteed. Once reserved, a customer can book a test drive, negotiate pricing, go through all the terms, and address any potential questions or issues without purchasing the vehicle in full. The online “Purchase Vehicle” option then allows buyers to use a major credit card or a PayPal account to complete the transaction. Consumers still have the choice of speaking with a sales representative in person to complete the financial terms. While the payment of the vehicle is complete, there is absolutely still a need for paperwork to be done at the dealership. “This is beneficial to people who are strapped for time or simply want to shop from the comfort of their couch,” the dealership said in a statement. Doug Stephens, a retail futurist who runs the website Retail Prophet and has advised auto companies about their retail approaches, isn’t shocked a dealership is moving entirely online. “I think that is where we’re going,” he said. Online car buying is being driven by both the convenience it offers customers and the savings it brings to dealerships, Stephens said. He compared the Koch’s idea to used-vehicle dealer Carvana, known for its vehicle “vending machine” towers in the United States. While there might be a market for online reservations, any sort of volume of complete transactions might be a ways off, Stephens said. “The consumer who gets online, buys a car with their credit card and picks it up an hour later might be a small piece of the pie today.